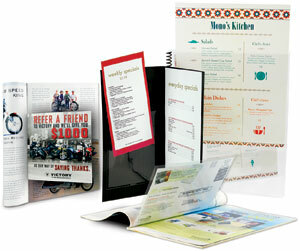 Both vinyl and polypropylene sleeves and pocketed envelopes come in a variety of sizes, colors, and thicknesses. The finish of the materials can vary based on your application. 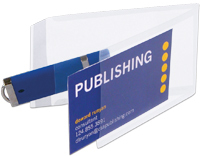 If the product is used for presentation than either material type can be offered in polished clear finish or orange peel. For a greater visual effect the polished clear in vinyl or polypropylene is the most desirable. In the case of long term storage the polypropylene materials in an orange peel finish are recommended. Both sleeve and pocket material choices provide storage and protection for your product or documents. Sleeves and pocket envelopes are made in a wide range of sizes and thickness, but generally in 4ml to 10ml gauge material. Plastic sleeves and pocket envelopes are an excellent alternative to paper versions when durability and protection is important or when transparency is desired. Ideally used for a wide range of commercial and industrial applications. We can make-to-order almost any variation of sleeve or pocketed envelope – from small to large, clear to opaque, multiple closures and pocketed options. Our sleeves and pocketed envelopes can be personalized with screen printing, digital printing, foil stamp and emboss to add a high-end look and feel to any finished product. No matter what material you choose all options offer durability, flexibility and quality in comparison. Making a statement with your company’s logo will both strengthen your relationship with customers and continuously display your brand to potential customers.